Servicing all of Sydney, call us now or contact us via our contact form to take advantage of this amazing offer today! The Lockwood 001 Double Cylinder Deadlatch is a very popular lock in Sydney and all of Australia. In fact, it has been a go-to choice for houses in the area for years now. If you have been wondering how to get your hands on this beaut, then you have come to the right place. That is because Fusion Locksmiths is offering to supply and fit this home lock for only $300. This offer is available to all within our Sydney service areas. What is The Lockwood 001 Double Cylinder Deadlatch? 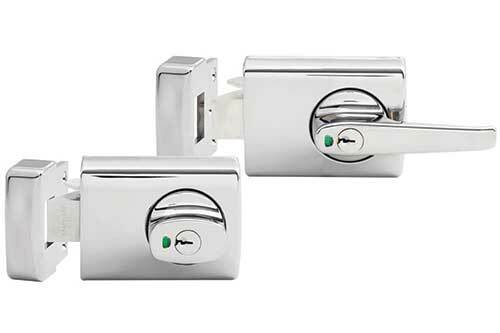 The Lockwood 001 Double Cylinder Deadlatch is a superior locking device designed in Australia. Unlike any of its contemporaries, this lock incorporates state-of-the-art safety features including the titular Safety Release and LockAlert. These qualities give this product market-leading performance and reliability for any property. The home lock is available in both Knob and Lever versions. More importantly, it is designed in accordance with the security and durability requirements of the Australian Standard AS4145.2-2008 | SL7D8C6. Not only does it have a cut-resistant Stainless Steel Bolt, but it also offers a door frame strengthener and 11 cloaked anchorage points. Ultimately, this makes the Lockwood 001 Double Cylinder Deadlatch a go-to option for high-security protection. The Lockwood 001 Double Cylinder Deadlatch comes with Lockwood’s very own patented LockAlert status indicator, which basically shows the Lockset mode at a glance. It is worth noting, too, that it can operate in three modes. Secure Mode – In this mode you need a key to both enter and exit. Safety Mode – Requires a key to gain entry however you are free to exit from the inside. Passage Mode – Allows to freely enter from outside and exit from the inside. SafetyRelease – Gives the lock the ability to automatically unlock the internal knob upon entry in order to minimise the possibility of you being locked in. Kinetic Defence – Gives the lock the much-needed resistance to bump and lock picking tools for added security. Retrofitable – If you have an existing 001 Deadlatch, you can use this to replace it. The lock is even suitable for 30-45mm timber framed doors. 2 Keys Included – Yes, that is right – it includes 2 keys. What’s more, they can easily be keyed to fit other Lockwood door locks. Its unique safety release feature comes with a lock alert. As mentioned above, if you unlock the door from outside, it automatically unlocks the knob inside. A latch holdback feature is added to it. If you want to activate it, you just need to turn the knob 100 degrees clockwise. Doing so will automatically put the knob in a locked position. The lock’s bolt is made of stainless steel that has 20mm projection to prevent opening during door charge down attacks. Plus Lockwood offer a 25 year Mechanical Warranty on all their products. So, what are you waiting for? Do yourself a favour and upgrade to one of the most popular lock brands in Australia. Better yet, contact Fusion Locksmiths now and take advantage of this amazing offer!